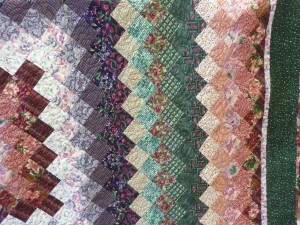 “Around the World” fabric search – ends in success at Wooden Spools! Linda and her incredible “Around the World” Quiltshe got the fabric for this quilt. She was on a business trip with her boss in Portland, Oregon – and managed to convince him to wait for her while she spent a couple hours in a terrific fabric store (Daisy Kingdom) shopping! 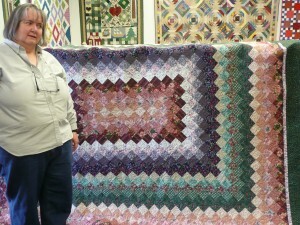 she got her quilt about halfway completed – and then it sat – for 10 years. Recently, she picked it up again and finished it. 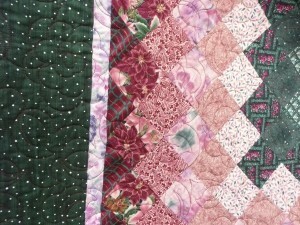 It needed a border, however; but the green fabric she wanted to use was no where to be found. She not only couldn’t find the same fabric – she couldn’t even find any fabric in the same shade of green!! How ’bout that great border?